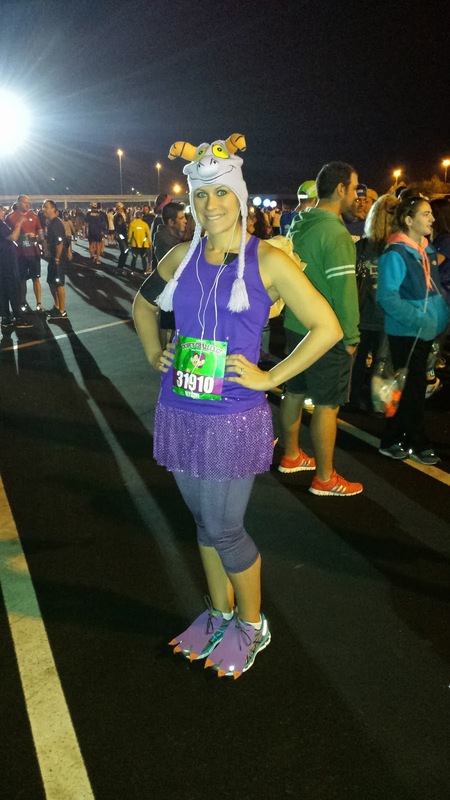 Part 2 of the 2014 WDW Marathon Weekend Race Report. If you missed part 1, all about the expo, check it out HERE. 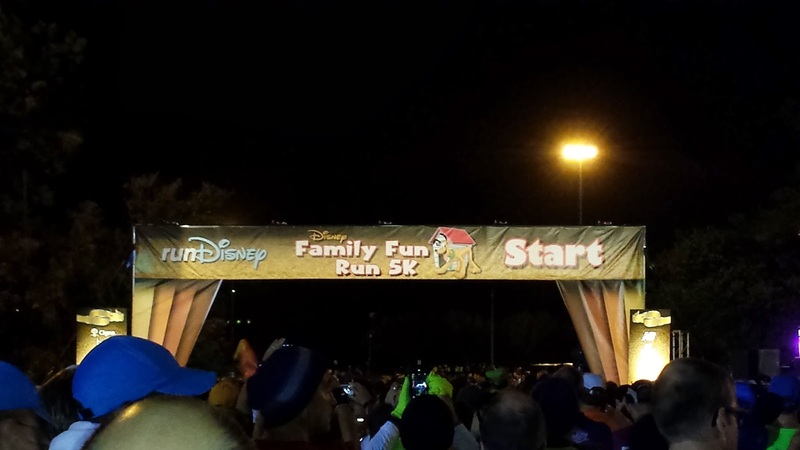 The 5k began at 6:15 on Thursday, January 9. Luckily my phone has beautiful-sounding chimes as the alarm, because today was the first of four very, very early mornings! It was also somewhat comedic, with all that went wrong. Luckily this all happened during the 5k and not one of the longer distances of the weekend. Early wakeup meant I wasn’t quite “with it” yet. 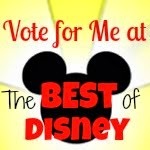 I woke up, got dressed in my Figment costume, and my dear husband made a comment about his i-pod. Oh crap! I didn’t charge anything last night!!!!! My Garmin was completely dead and my i-pod had a little juice left. I quickly plugged them in, but there was no way to get it all going in 10 minutes. I took my chances with the i-pod and left the Garmin behind. We went along to the lobby thinking the fountain drinks would be open. Drat! No drinks, which equaled no caffeine. Alright, let’s get on the bus (we stayed at the All-Star Sports, so we used Disney transportation to the start line). Here we go—where’s my breakfast? Damn! I left it on the bed! 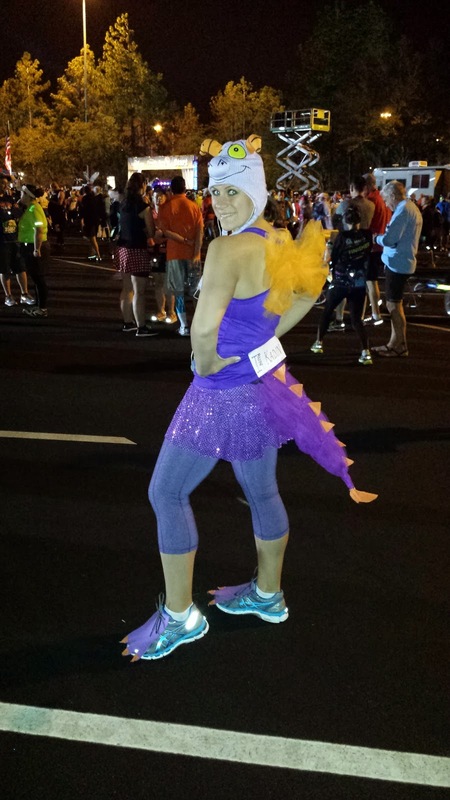 See…like I said, comedic, but only because it was the 5k and not a longer distance! Guess I was running on an empty stomach and with no caffeine. In training for the race, I really stuck with Jeff Galloway as the “lead plan” (I added a little Hal Higdon and modified the Galloway “walk” to be a run). I also listened to him on the Mickey Miles Podcast and other outlets to figure out what a good race plan would be. My plan for the 5k was to run it like a weekday training run, which I usually run around a 10-minute mile, and walk through the water stops. There was the usual fanfare at the start. The 5k is nice because the start line is fairly close to where you get dropped off. I started in corral B, so it wasn’t long before we got going. The course was a little congested at the start, but thinned out quickly. The first mile is on road/parking lot before you enter Epcot under Test Track. We circled “around the world” with a small detour around the international gateway park entrance. I ran with my phone and contemplated a picture with Dopey, but the line was literally over a hundred people long. I stopped for a few selfies, but really just wanted to get to the finish. There weren’t many other tempting photo stops, anyways, so it wasn’t too much of a struggle. 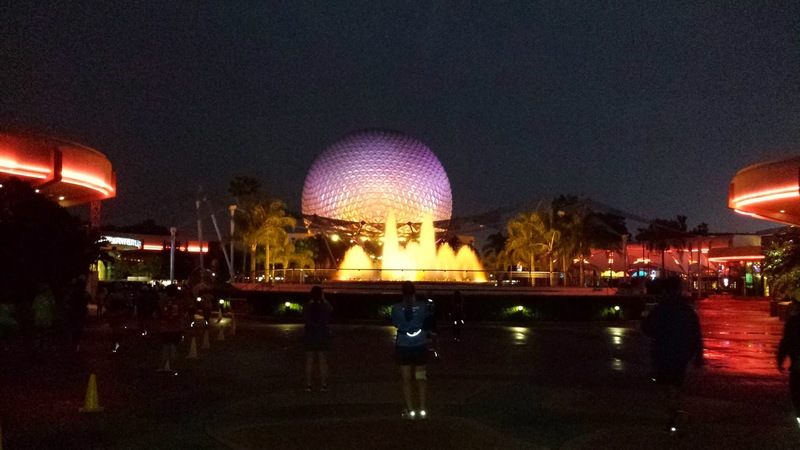 Around Spaceship Earth and off to the finish line. It was a great warm-up run. 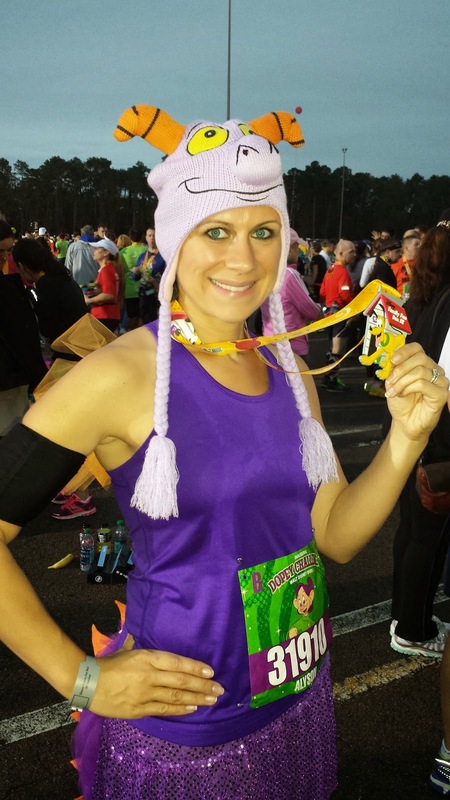 At the finish, I collected my Pluto medallion and headed to the Dopey tent for my wristband. This was a mess, with everyone being herded too early and people not moving through toward the end of the line. I walked to the end where dozens of volunteers were waiting with no lines (for the record, runDisney fixed this the next day). I also collected my water, Powerade, food box, and banana. My hubby snapped a few finish line pics and BOOM—race 1 was done! It really went by fast. I didn’t do much in terms of recovery, since this was pretty much nothing compared to the distances I had been putting in during training. We DID, though, get a little nap in after a shower. We spent the day in the parks, enjoyed some great meals, and made it a somewhat early night, trying to get to bed knowing those beautiful-sounding chimes were about to go off again, even earlier. 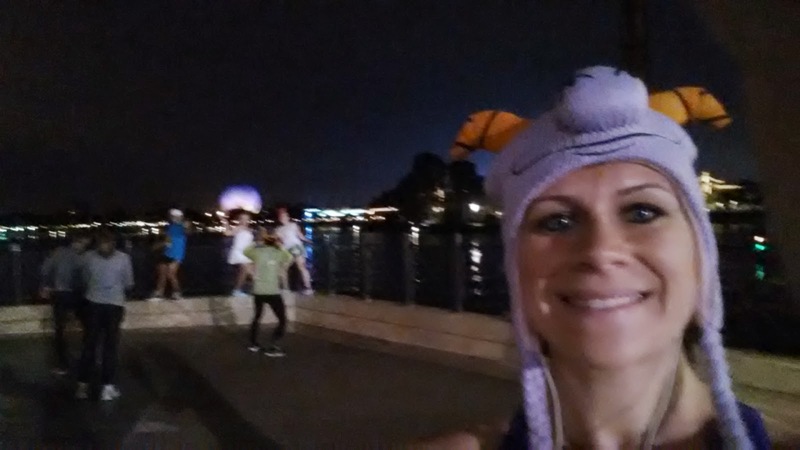 Day 2 of the Dopey Challenge! Great recap!! cant' wait for the rest!